Background: When dental implants are applied in partially edentulous patients, there is the risk of placing the implants in close proximity or in direct contact with the adjacent roots. In this situation assurance of pulp vitality of the adjacent tooth is neessary. Objectives: The current study aimed to assess pulp response of the tooth after root proximity with dental implant. Patients and Methods: After investigating 2800 records of patients, 31 implants in 29 patients were included in this study. A parallel peri-apical radiography was taken and pulp vitality tests (cold, heat and electrical pulp tests) were conducted for each patient. Results: Among the 31 assessed implants and the adjacent intact teeth, 13 implants had direct contact and 18 implants had proximity of less than 1 mm with the adjacent root. All of the teeth had positive (normal) pulp response to all tests. The most prevalent areas for proximity of implant-tooth were upper first premolar implants and upper canine teeth. The most approximation area was apical third of root of the teeth. Conclusions: Based on the clinical and radiographic examinations, implant-tooth approximation (less than 1 mm or direct contact) is not related to pulp vitality of the tooth. Further studies with larger sample sizes are necessary to confirm the results of the study. Titanium implants have gained a wide range of applications to replace the missing teeth in the recent two decades (1, 2). More than 90% of dentists currently perform dental implant procedure on a routine basis in their professions (3). On the other hand, compared with complete and removable partial dentures, implant-supported prosthesis has higher quality, longer life span and better maintenance of alveolar bone height (4-6). However, when dental implants are applied in partially edentulous patients, there is the risk of placing the implants in close proximity or in direct contact with the adjacent roots (7, 8); therefore, a two- millimeter safety space between the implant and the adjacent root is recommended (9, 10).The most prevalent reasons for placing the implant close or in contact with the tooth or even damage the adjacent root include lack of information about the surgical anatomy, implant placement in erroneous areas, wrong placement angle, and errors in the assessment of the space to the adjacent teeth (11). Exact awareness of surgical anatomy, radiographic information of surgical location, and determining the exact location of the adjacent tooth lessen the occurrence rate of these approximations and damages (12-17). Renjen et al. (18) and Dao et al. (7) reported researches in beagles that even if a mini-screw damaged the dental root, pulp complication did not occur. On the other hand, some case reports showed the loss of pulp vitality after the implant-tooth contact (12, 19). Since the results of previous studies in terms of the influence of implant-root approximation/contact on the vitality of pulp are not conclusive, the current research aimed to evaluate the dental pulp complications in cases with implant-tooth proximity. Two thousand and eight hundred records of patients at implant department of dental faculty of Tehran University of Medical Sciences were reviewed (1999 up to 2014), based on the existing radiographic examination and the recorded history. It was a case series study. The inclusion criteria were: at least 12 months from implant placement, there must be the evidence of implant-tooth proximity of less than 1 mm or direct contact in the post-surgical radiography available in the patient's record, and that the adjacent tooth being intact at the time of implant placement. The exclusion criteria were: patients with psychological disorders, any dental caries and major/deep restorations on the adjacent tooth, the presence of crown, root canal therapy, and extraction of the adjacent tooth after implant placement for definite reasons that could not be related to implant damage. Cold test: After cleansing, drying and isolating the tooth, a large cotton pallet (that provided as much surface area as with tooth surface) was sprayed with a cold spray at -50ºC (Endo-Frost®; Roeko, Langenau, Germany). Then it was applied to the facial surface of the tooth. This test was initially implemented on a normal tooth (the contra lateral tooth) as a blank tooth. Finally, tooth response was compared with the blank tooth response. The severity of pain response was compared to that of the blank. The pain response like that of the blank one was considered normal. If pain response of the adjacent tooth was stronger than that of the blank tooth (but returned after irritation), it was reported as reversible pulpitis. Similarly, if the pain response of the adjacent tooth was higher regarding severity and duration (seconds to minutes) or if it had spontaneous pain, it was reported as irreversible pulpitis and no response was identified as a necrotic pulp (20). Heat test: All the steps were conducted exactly similar to those of the cold test; the only difference was the heating method which was carried out by alcohol burner and warm plugger (20). Electric pulp test: This test was performed with electric pulp tester (PULP TESTER, China). The pulp response to the electric testing did not reflect pulp inflammation but it only determined vitality status. The test was initially implemented on a blank tooth (the contra lateral tooth) to establish standard responses and inform the patient what normal sensation is. After cleansing, drying, and isolating the tooth, lip clip of the device was installed and the probe tester coated with Vaseline (as electricity conductor) was placed in the incisal third of the buccal or facial area of the tooth. Normal pulp response is tingling, warm feeling or pain in the tooth and lack of any sensation means the pulp is necrotic (20). At the end, the results of three pulp vitality tests were compared with one another and pulp status was determined. After considering the inclusion and exclusion criteria, 45 patients (47 implants) were selected. During the examination, another 16 patients were excluded due to the following reasons: recent root canal therapy of the adjacent tooth (one case); presence of crown on the adjacent tooth (three cases); the absence of approximation/contact based on the new radiography (eight cases); detection of caries on the adjacent tooth (one case); severe attrition (two cases); and deep restoration (one case). Finally pulp vitality tests were conducted on 31 adjacent teeth (29 patients) (Figure 1). Based on the radiographic examinations, among the 31 investigated implants and adjacent teeth, 12 implants had apical third direct contact at apical third of the tooth and one implant in direct contact at one third of the middle of the adjacent dental root. Fifteen implants had proximity of less than 1 mm at apical third of the root and three implants had proximity of less than 1 mm at middle third. The teeth had positive (normal) pulp response to electric pulp, cold and heat tests. The most prevalent area for implant-root proximity was upper first premolar-canine, (14 cases). The most approximation area was apical third of the teeth (27 cases) (Figure 2). Content is based on the universal tooth numbering system. The current study was performed on 29 patients (31 implants). According to the study results, implant proximity of less than 1 mm and direct contact to adjacent root did not have any relationship with pulp complications of the tooth. Researches in beagles showed that direct mini-screw damage to the adjacent root and entrance to dentine and pulp did not cause pulp complications in the tooth (7, 18, 21). A study on four patients (22) indicated root contact with mini-screws during mesiodistal movement of molar. They concluded that the contact between mini-screw and dental root did not have any symptoms of pulp devitalization. A study (11) on three patients with direct contact (without invasion in cementum) of implant with apical third of dental adjacent root demonstrated no clinical and radiographic signs of pulp complication in the implant adjacent teeth. The results of previous studies were in parallel with that of the current study, they indicated that even the implants in direct contact to adjacent roots do not cause pulp complications for the teeth. A case study reported a patient (19) with implant approximation and direct contact with adjacent tooth and pulp who showed necrosis four months after implant placement and removal. They concluded that implant placement was the major causative factor of such pulpal damage. The differences in the result may be attributed to the implant contact at apical foramen and loss of pulp blood perfusion and innervations following the placement and removal of the implant; however, in the current study no implant contacts at apical foramen were observed in any of the radiographies. Another case study reported a patient (12) whose implant adjacent tooth devitalized one month after the implant placement. Post-operative radiograph indicated that the base of implant fixture entered the apex of adjacent root and it was concluded that such an implant placement caused pulp damage of the tooth. 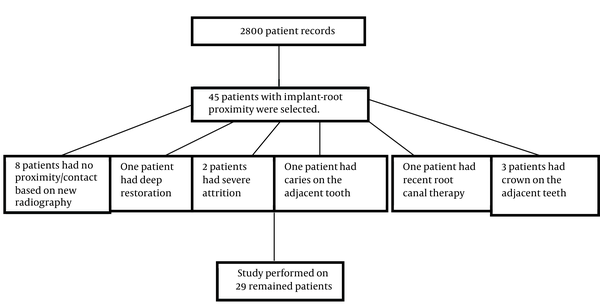 The contrast in the results was attributed to implant entrance and direct damage to dental root apex; however, in the current research no invasions to apex and root were observed in the patients’ radiographies. The advantage of the current study was the assessment of these parameters on human population in a case series study. The results of the study showed that based on clinical and radiographic examinations, Implant-root proximity (less than 1 mm or direct contact) does not affect the pulp vitality of the adjacent tooth. Further studies with larger sample sizes are necessary to confirm the results of this investigation.